Mini Monets and Mommies: 25 S'mores Recipes That You Have to Try Right Now! 25 S'mores Recipes That You Have to Try Right Now! August 10 is National S’mores Day! I kind of adore the graham cracker, chocolate and marshmallow stackers, so this is a pretty major holiday for me. That said, I like to go a bit beyond the traditional treat. 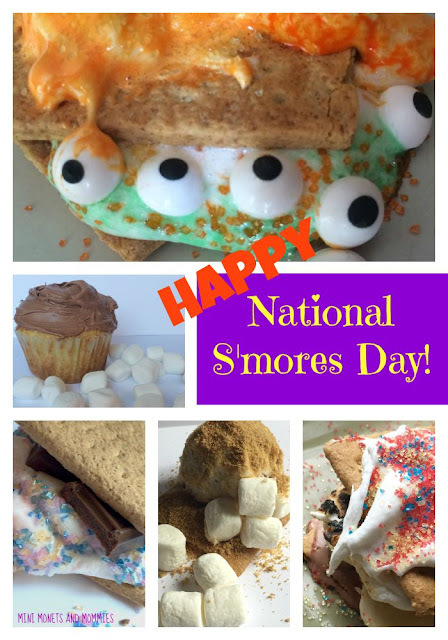 Check out these sweet, sweet s’mores, that you make for the treat’s special day – or any day! 1. Animal Cookie Ice Cream Sandwiches – Perfect for an animal, carnival or circus themed kids’ party! 2. Banana Splits – The classic summer sundae in s’mores form. 3. S’mores Cookie Ball Truffles – So, they’re not exactly the typical flat stack, but these Oreo goodies are so, so, so, so good! 4. Peeps and Marshmallow-Middle Chocolate Eggs – It’s two Easter candy traditions in one perfect package. 5. St. Patrick’s Day Desserts – They’re lucky, chocolatey and green! 6. Valentine’s Day Donut Deluxe – Heart-shaped marshmallows, a donut and more makes this s’more a sweetheart surprise. 7. Hanukkah S’mores – Celebrate the Festival of Lights with a festival of fun chocolate goodness (and you can even make them kosher as well). 8. Christmas Morning Donuts – The holiday morning donut is a tradition in our house. We took the typical and made it Christmas-tastic by adding in more s’mores. 9. Candied Yam Marshmallow Casserole – It’s so Thanksgiving. Think of this one as a deconstructed sweet potato pie. 10. Cupcake Cuties – Swap out the chocolate bar for a sliced cupcakes! 11. Candy Corn for Halloween – The sugary fall treat makes the sweet stacker even better. 12. Monster Madness – They’re gooey with goodness (and candy eyes!). 13. ModernArt – A little food coloring and you’ve got a painted masterpiece. 14. Olaf’s Melting – The Frozen snowman melts in the microwave with this indoor s’more. 15. Cherry Red Coconut Concoction – It’s a bit more grown up, and totally tasty. 16. Pink Princess Sparkles – They’re pink with strawberry scent and sparkle with a sugar crisp. 17. Chocolate Marshmallow Cupcakes – It’s everything you love about the stack, including the graham crackers, in a cupcake design. 18. Cookies – These S’mores Cookies from Fireflies and Mud Pies turn the campfire favorite into a kitchen creation! 19. Bread Pudding – When it comes to creative, this recipe from Spaceships and Laser Beams takes the cake (or rather, the bread putting). 20. Brownie Trifle – Yum! Mom Endeavors’ trifle is brownie-packed and full of marshmallowy goodness. 21. Rice Krispie Treats – They already have marshmallows in them anyway, so why not try this kid-friendly treat from Real Life at Home? 22. 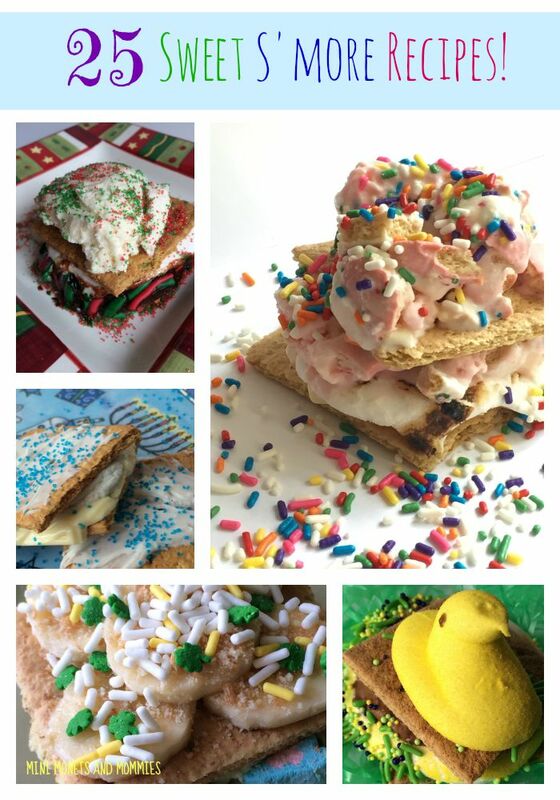 Sweet and Salty – Pint-sized Treasures has combined the sugary and savory tastes that you will want to try – right now. 23. Mini Pies – These pint-sized pies from Mess for Less are still big on suburb s’mores taste. 24. Banana S’mores – The Typical Mom’s BBQ taste treats are literally bananas! 25. French Toast – Crazy Adventures in Parenting’s breakfast recipe is a mouthwatering morning treat. Are you still on search for more s’mores? Follow my Pinterest board for ideas galore!